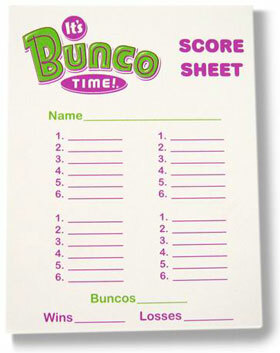 The only game officially sanctioned by the World Bunco Association®! A game of dice, luck & prizes. 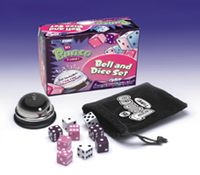 Ring the bell, roll the dice and your partner cheers you on as you accumulate points. The pace gets faster as your opponent takes the dice and rolls to try to beat your score. The bell is rung, you've won the round- change partners and continue on with the excitement. Play for fun with as few as 4 to 8 players or join the thousands of people who have formed their own clubs and host parties monthly throughout the year! Each person plays host only once a year - Get it? 12 people = 12 months! Pick a day, like the first Monday of the month. It's a way to make new friends. 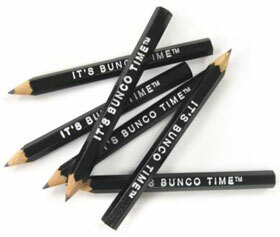 It's Bunco Time!! !™ travels from host to host each month. Just put everything back in the convenient carrying box and pass it on - just like that! 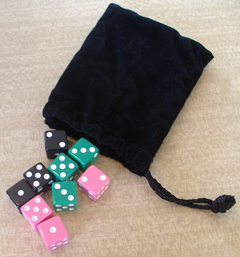 Nine colored dice (black, green,pink) with white pips in a velveteen pouch. 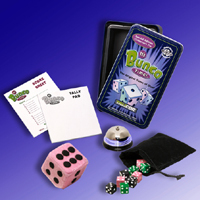 Collector Tin comes with: Bell, 9 dice in drawstring pouch, miniature fuzzy die, tally pads and score sheets; everything for a party of twelve. Dice & Bell Set comes with: Bell and 9 dice in drawstring pouch . 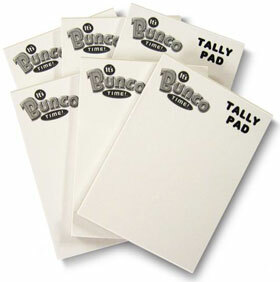 Bunco® is a registered trademark of the World Bunco Association®. 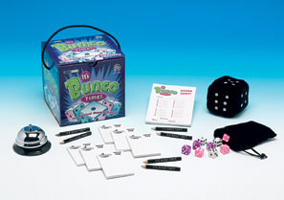 Copyright 1996 World Bunco Association. All rights reserved.